Elmore James (January 27, 1918 – May 24, 1963) was an American blues singer and guitarist. He was known as The King of the Slide Guitar. Born in Mississippi, he joined the Navy as a young man, and had his first hit record, "Dust My Broom," in 1952. Later settling in Chicago, he recorded several more classic blues hits, including "Look on Yonder Wall," "The Sky Is Crying," "Standing at the Crossroads," "Shake Your Moneymaker," and "It Hurts Me Too." James' music was characterized by his intense, high-pitched vocal style and driving guitar riffs. He was a pioneer of the fast-paced rhythmic style that influenced the early rock musicians, and his electric slide guitar technique is still much imitated by guitarists today. James was born Elmore Brooks in Richland, Mississippi, 50 miles north of Jackson. He was raised by his parents, who worked as sharecroppers on several farms in the Durant area. Like several other blues players of the era, his first instrument was the "diddley bow," made by stringing a strand of broomwire from a nail attached to his front porch. He began playing semi-professionally under such names as "Cleanhead" and "Joe Willie James," alongside musicians such as the first Sonny Boy Williamson, Howling Wolf, and the legendary Robert Johnson. During World War II James joined the United States Navy and was stationed in Guam. Upon his discharge Elmore returned to central Mississippi and eventually settled in Canton. He began recording with Trumpet Records in nearby Jackson in January 1951 as sideman to the second Sonny Boy Williamson and others. He first recorded as a lead singer in August of that year with what became his signature song, "Dust My Broom." A quiet, shy man, James was reticent to record his voice. His producer reportedly tricked him by recording what James thought was merely a jam session. The single was released without James' approval, reaching the number 9 position on the R&B charts in 1952. Suddenly, the bashful Elmore James was a star. His "I Believe" was another hit a year later. Over the next seven years he recorded for the Bihari brothers' Flair Records, Meteor Records, and Modern Records labels, as well as for the better known Chess Records. His backing musicians were known as the Broomdusters. During this period he lived both in Chicago and Mississippi. In 1957, James was diagnosed with heart disease. He also took a job as a DJ in Mississippi for a time, when not recording or performing on the road. In 1959, he began recording some of his best sides for the Fire Records label. These include "The Sky Is Crying," "Stranger Blues," "Look On Yonder Wall," "Done Somebody Wrong," and "Shake Your Moneymaker," all of which are among the most famous of blues recordings. James recorded for the Fire label until 1962, when he was forced to temporarily retire because of a dispute with the musicians' union. After the dispute was resolved, James was preparing for a recording date in May, 1963, when he succumbed to his heart attack at the age of 45. Record companies continued releasing James' singles until 1966, and various compilations of his "greatest hits" and "best of" albums continue to be released to this day. He was inducted into the Blues Hall of Fame in 1980, and his grave site is listed by the National Parks Service. While Zappa's characterization is a hyperbole, Elmore James' was indeed famous for a few particularly memorable riffs, played with remarkable effectiveness. His playing style won him the monniker "King of the Slide Guitar." James' passionate, high-pitched vocals also made him one of the most recognizable blues performers on record. His no-nonsense, driving style on both guitar and vocals expressed tremendous intensity, incongruous from this shy, unimposing man. Many of James' most popular songs featured a fast, 12-bar blues shuffle with a heavy back-beat typical of what later became known as rock and roll. His use of the electric guitar enabled him to amplify the other-worldly slide guitar riffs learned from such Mississippi Delta masters as Robert Johnson, putting them to powerful effect together with drums, bass, piano, harmonica, and occasionally horns. While his voice was not nearly so powerful as other Chicago bluesmen such as Muddy Waters and Howling Wolf, James more than made up for this by an unmatched intensity. If other singers could use their voices to hit their listeners in the solar plexus, James could use his to make his audience's hair stand on end. As a guitarist, he opted for simplicity over virtuosity. His riffs were designed to be more memorable than technically impressive. This made him all the more effective both as a live performer and a recording artist. While Elmore James' status as a slide guitarist is well known, his influence as a pioneer of rock and roll is not to be underestimated. James' records were listened to with rapt attention by a generation of young musicians who would go on to become the top early rock and roll artists. Early rock innovator Little Richard is quoted as saying: "There was just a few people doing real rock back when I was first starting out. Little Richard and Elmore James are the only two I know." 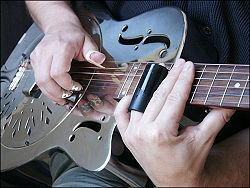 Slide guitarists use a bottleneck, metal tube, or steel bar to create pitch changes rather than fretting the strings with the fingers. Most electric slide guitar players will gladly admit to being strongly influenced by Elmore James. "I practiced twelve hours a day, every day, until my fingers were bleeding, trying to get the same sound as Elmore James," said Robbie Robertson, guitarist of The Band. James was also a major influence on rock guitarists such as The Rolling Stones' Brian Jones, Fleetwood Mac's Jeremy Spencer, and Duane Allman of the the Allman Brothers Band. Another guitarist who admired Elmore James was Jimi Hendrix. James' up-tempo cover of Robert Johnson's' "Cross Roads Blues," released as "Standing at the Crossroads," was for many years more well known than the original until Eric Clapton and Cream released their own famous version in the late 1960s, which paid tribute to both predecessors. His songs "Done Somebody Wrong" and "One Way Out" were covered by the Allman Brothers Band. Blues guitar prodigy Stevie Ray Vaughan also often performed his songs in concert. James is mentioned in The Beatles' song "For You Blue": while John Lennon plays the slide guitar, George Harrison says, "Elmore James got nothin' on this, baby." ↑ Elmore James, Martin and Lisa Adelson, 2002. Retrieved January 18, 2008. ↑ Additional Sites, National Parks Service, 2001. Retrieved January 18, 2008. Elmore James – Artist Direct. This page was last modified on 12 September 2017, at 15:00.